System Era Softworks recently unveiled their largest content update which introduces improved basebuilding to Astroneer. 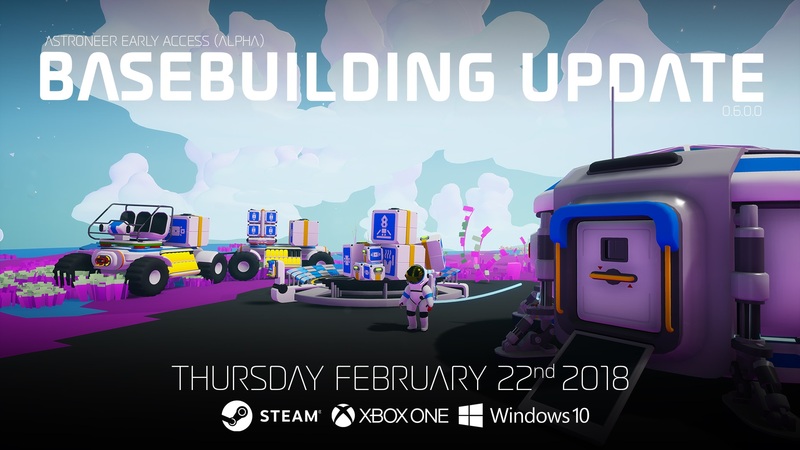 The Astroneer team at System Era Softworks posted a new blog entry and trailer for the game’s upcoming “Basebuilding Update” today. As the update’s name suggests, major changes have been implemented in regards to how players create bases in Astroneer. This includes the introduction of free standing movable base platforms. Upon downloading the new update, players will have greater freedom in creating bases using these new, movable platforms. What’s more, three brand new Platforms have been added which include two versions of the Medium Platform and a Large Platform for base modules. To improve the overall flexibility of base configurations in Astroneer, these objects can now be set and rotated individually. To lock your Platforms in place, simply connect them to power. Should you need to adjust afterwards, all you need to do is disconnect the power lines and move things around accordingly. Other items included in the new Basebuilding Update are Fabricators (portable printers that allow you to make bases), and the addition of over 20 new pieces of art for items such as Control Panels, Modules, and Platforms. The update is scheduled to launch later today for Steam, Windows 10, and Xbox One, and is reportedly the largest content update for Astroneer yet. To learn more about the Basebuilding Update for Astroneer, be sure to read through the full patch notes posted by System Era Softworks. For more on System Era Softworks, click here to check out our in-depth feature on the team!